[AUTO](VC):When your G unit Stride, you may Soul Charge (2). 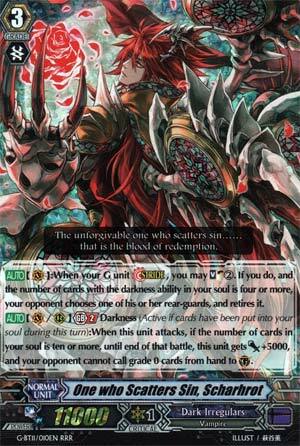 If you do, and the number of cards with the darkness ability in your soul is four or more, your opponent chooses one of his or her rear-guards, and retires it. [AUTO](VC/RC) Generation Break 2 Darkness (This ability is active if cards have been put into your soul during this turn):When this unit attacks, if the number of cards in your soul is ten or more, until end of that battle, this unit gets [Power]+5000, and your opponent cannot call grade 0 cards from hand to (GC). Welp, now it's the turn of Dark Irregulars to get reviewed, since the themed format seems to be working out pretty well. New Scharhot...well, the Stride skill is a straight up improvement, being free, and immediate, so it gets around Dizmel...to a point. The GB2 being useful as a rear-guard as well as a Vanguard is also pretty sweet, any Silent Tom-like rear-guards are always useful. Not AS useful since G-Guardians exist, but obviously a prime target for triggers. Otherwise, not particularly interesting to talk about. He's good. That's all you need to really know. Let's wrap up the clan weeks with Dark Irregulars! DI got a pretty good update this set, with some great support for the Darkness style. Scharhrot 2.0 is a great improvement over the original, as not only is the stride skill essentially free (including the retire if you have enough Darkness cards, which you should) but his other skill makes him a valuable rear guard too, becoming a stronger Silent Tom. Easily included in any deck full of Darkness, even Bladewings are running him as backup to help accelerate soulcharging when not on Sullivan.